Richard had been feeling sick for quite some time, with tiredness, change in stool and abdominal discomfort. Since March 2014, he had been seeing our local and highly recommended gastroenterologist. In August, an MRI was ordered, which showed a cyst in the pancreas. My husband was given Creon to take and told to go home and that we will follow it. “These things are rarely malignant,” we were advised. For a short period Rich felt better, but then his symptoms started to increase and he began losing weight. The GI doctor’s solution was to increase the dose of Creon and refer us to a gastroenterologist at Montefiore Hospital who would perform an EUS. We were not comfortable with the doctor and didn’t continue with him. One of our many guardian angels, in the form of a good friend, saw that Rich was struggling and told us about Dr. Chabot and the Pancreatic Center at Columbia. Rich did his research on their website and felt confident that this is where he wanted to go. We were so anxious the day of the consult and frightened. Why was my husband so sick? Walking into Columbia gave us the sense of highly trained professionals who also possessed warmth and expressed sincere care towards their patients. I remember that on our first visit in October, the waiting room was a bit intimidating as there were patients in different stages of care and chemo treatments. It was an eye opener to see all ends of the spectrum of patients - from those that looked fine (like Richard) to those that were evidently very, very ill. But surely my husband doesn’t have cancer I told myself. He probably has pancreatitis and will be treated accordingly and all will be fine. Right? Cancer can happen to other people but not to my husband. Rich drank liquor occasionally, didn’t smoke, always ate a well-balanced diet of freshly prepared foods and exercised regularly. He certainly didn’t match the profile of someone with pancreatic cancer. We met with Dr. Schrope, Don our NP with the colorful socks and Dr. Gress. These professionals interacted as a team ― “our team”. Each spoke to us about their specific expertise and how they would treat my husband. We never felt rushed and were encouraged to ask questions. They were uplifting and encouraging but yet very straightforward and factual. Many diagnostic tests and blood work were ordered as well as a scheduled EUS. The results of the EUS were inconclusive however Rich became jaundiced and in early November, Dr. Gress performed an ERCP where a stent was inserted into the biliary duct. When the test results were in, we received the “phone call” that our team would like to discuss the results with us ASAP. I remember emotions such as feeling numb, panic and anxiety through the roof. On November 13, 2014 we met with Dr. Schrope and Dr. Gress to discuss the findings. In as supportive and gentle a manner as possible, as if it was equally difficult for her to tell us as it was for us to hear it, Dr. Schrope shared with us the indications of all the test results. To hear the words suspicious in nature and very probable for pancreatic cancer was like being given a death sentence. Our hearts stopped and our world fell apart. She respected our request that we needed a few minutes alone to absorb this before discussing the next step. That day, we placed our future in Dr. Schrope’s hands as she meticulously outlined the surgical procedure which would be followed by chemo. We returned home in utter disbelief as to what was going to happen and what could happen to Richard. Surgery was scheduled for November 21, 2014. Richard felt doomed and that his life would be over in a short time. For the first time in his life, my husband started really thinking about his own death. The feelings of fear and hopelessness went back and forth in his mind for days. We knew Rich’s life was about to change forever. We told ourselves that it was fortunate that the cancer was discovered at stage 2A but he would have been more fortunate had we gone to Columbia Presbyterian earlier. Perhaps the cancer would have been diagnosed earlier at stage 1. We were upset but quickly decided that we couldn’t spend our energy on looking back but instead needed to face the future as a team. Part of our Story of Hope is that Richard and I met just 4 years earlier on eHarmony. We are in our 60’s and were thankful that our paths had crossed. We were making plans for our lives together; pancreatic cancer wasn’t in them. As many others in a similar position, we couldn’t bear the thought of one of us not being here. How many Christmases or birthdays spent together did we have left? Rich was so frightened of his life ending in pain and suffering. Rich was recovering nicely and ready to be discharged during the expected 7 to 10 day hospital stay when complications from a blood transfusion kept him in the hospital for 1 month. As much as we trusted every doctor and specialist who cared for my husband, the only rock we could turn to for comfort and hope was our belief in our faith. Although we could not change the cards that were dealt, we prayed for the courage to face our challenges, to make the best possible treatment decisions available to us and to let Richard be a statistic of survival. After 30 days in the hospital, Rich came home ― frail, weak and saddened that he would be depending on Creon and insulin for the rest of his life. It was a very slow and steady uphill climb, but our faith in God, the support of family and friends and trust in our medical staff gave us the hope and strength we needed to make facing every day a little bit easier. Dr. Schrope and her team and Dr. Saenger, our oncologist, became our hope and guiding light for us to live a fulfilled life. We put in them our unwavering trust and in return we received their expertise, guidance, understanding, comfort and encouragement and yes, a whole lot of hope. 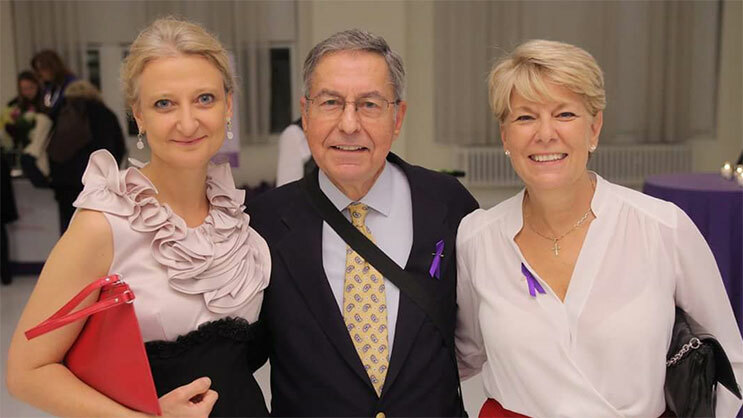 Through the support group and pancreatic cancer functions, we met many survivors of presently up to 17 years. There are unspoken words among all of us attending that we are among friends that share the common fear of what is next in our future but also that we are so hopeful for our future because we are patients of Columbia Presbyterian, offering us cutting-edge technology and treatment protocols. Richard and I were married on August 2, 2015. After all we had been through, we looked at each other and thought, “What are we waiting for?” Our lives are not as we envisioned when we first met but in many ways, we are more connected. It’s a greater appreciation of life and how quickly it can change. Our team at Columbia has become our extended family. We couldn’t wait to email them a picture of us on our wedding day and share our happiness. Because of these miraculous people, Richard was on his way to recovery. Because of the surgery, Richard became a type 1 diabetic. This was quite a life changer but with faith, patience and love, this challenge was managed well. Hope became reality when last October we went on a 3-week cruise down the Danube from Prague to Budapest. Rich did a fantastic job of regulating his insulin and enjoyed the local food and wines. This fall we are planning a trip to the Grand Canyon. Every three months, before the dreaded CT/MRI, we become anxious, wondering what the result will be. Rich tells me that a day doesn’t go by where he doesn’t think of what is happening inside him. We place our anxiety in God’s loving hands that He will give us the strength to handle whatever the future holds. After all, we believe that it was God that steered us to Columbia Presbyterian. The “wondering if….” will now always be a part of our lives, but without hope there is no future to look forward to. After the surgery, a friend gave Rich a plaque that says, “Never, ever, ever give up”. With hope, there is no giving up. With hope, there is only looking forward.